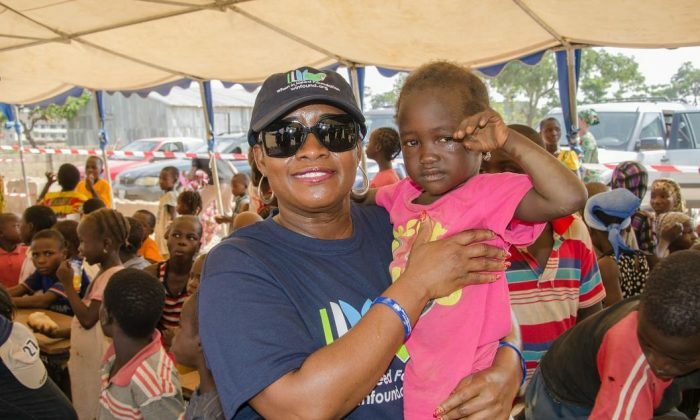 “Angelina, who is a beautiful three year old orphan, did not want to let go of my hands as I held her, so I continued to hold her until we finally had to go,” told me Ms. Chetachi Ecton, founder and CEO of the When In Need Mission of Mercy Foundation (WINMOM), during an interview in her Queens, New York office. Ms. Ecton met Angelina when they visited the Nigerian Kuchingoro Internally Displaced Persons (IDP) camp in the beginning part of a twenty-day journey to that country. At the camp, Ms. Ecton and her group were joined by a team of Nigerian volunteer doctors, dentists, nurses, pharmacists, lab technicians, nutritionists, and young volunteers carrying bundles of food—all of whom Ms. Ecton had previously made arrangements through her New York office with Nigerian officials to send. They had much to do. After a Year With President Buhari, Is Nigeria Backsliding? There are more than one and a half million people living in the hundreds of camps like the one in Kuchingoro, which are spread throughout this West African nation of 170 million people. Approximately one million of the people now living in these camps have come over the past seven years fleeing for their lives from the monstrous onslaught of the Islamic terrorist killing machine Boko Haram. Hundreds of thousands of others have also been coming for decades fleeing fierce internal ethnic, religious, and regional conflicts. Nature has also played a cruel role in this tragedy: thousands more have been driven from their homes to the camps by natural disasters—floods, droughts, and volcanoes—which have plagued much of the continent of Africa throughout recorded time. Adding to the poignant depth of this tragedy: The overwhelming number of those one and a half million living in the camps are either widows or children, with a majority of the latter, like Angelina in Kuchingoro, believed to be orphans. Kuchingoro differs from many of the other IDP camps located in Nigeria is that it is composed solely of those who came fleeing Boko Haram, which is one of the reasons why Ms. Ecton chose to visit it. Thank God that is true. America, Britain, and France have together donated an estimated $1 billion to Nigeria over the past year, and the European Union has more than doubled that amount. In addition, there are dozens of non-profit organizations, hundreds of times larger than WINMOM, including the Internal Displacement Monitoring Center, the Christian Aid Society, and Doctors Without Borders, which have donated hundreds of millions of dollars and devoted countless hours of human sweat and labor to provide food, shelter, clothing, and medical care to those living in these camps. However, unlike most of these foundations, which have received the lion’s share of their funds from private charities and public grants, WINMOM is funded solely by its founder. How Ms. Ecton achieved the financial success that enabled her to do this is a story that should make every American feel proud. To escape the poverty of Nigeria, Ms. Ecton upon her graduation from high school came to Dallas, Texas in 1986 at the age of 17, beginning her life in America living with her mother’s cousin who had previously immigrated to America from Nigeria. Two years later, she moved out on her own to Philadelphia, Pa., where she worked her way through college, eventually earning a B.S. in 1992, and soon after an advanced degree in social work from Widener University, located in the neighboring city of Chester. Then, after working as a social worker for almost ten years, she founded what was to grow into a major health care agency—most of the income from which she currently donates to her foundation, which she started in 2014. That philosophy was Ms. Ecton’s driving force throughout her entire journey, which after leaving Kuchingoro took her to villages that included Obodo Ahiara Mbaise, where she donated food and other vital supplies to a Catholic school for the deaf and speech impaired; to Ngor Okpala, where she assembled a team of engineers to install a running water system for hundreds of villagers who prior to that had to walk miles to gather water from a distant stream; and to Owerri, where she gave hundreds of pairs of shoes and hundreds of sets of school supplies to impoverished students attending a local primary school. She also visited the village of Ntuoke, initiating a program to teach dozens of selected villagers how to farm, and thereby, she told me, giving them the knowledge to feed themselves and others in their village; and, just as importantly she added, encouraging them to visit neighboring villages to share their newly acquired knowledge of farming with others. As she further reflected on her mission to Nigeria, Ms. Ecton, the mother of three young adult children, told me she realizes how much it means to her to be able to help others. “It is a great feeling to be in a position to help people in need as we were able to do throughout our trip. And all along the way as we met people who needed our love and support. At times while she spoke, I thought of the adage, “Some people live to work, and others work to live.” Ms. Ecton, whose foundation has come to the assistance of people in need in other countries, including Chile, the Dominican Republic, and Uruguay, does not fit into either of those two categories. Rather, it seems, she works so other people can live.